Lemon is a citrus fruit rich in vitamin C which is a powerful antioxidant with many health benefits. Lemon juice has been linked to improving heart health, boosting the body’s immune system, and improving iron absorption. Because of the acidic nature of lemon water or lemonade, it can also help to dissolve kidney stones. The juice of one lemon is very low in calories and contains up to half of your daily recommended intake (RDI) of vitamin C. However, it is not just lemon juice that has many benefits to your health. The flesh and lemon zest also have benefits because they contain fiber, calcium, vitamin C, and vitamin B6. The benefits of lemons and lemon zest are also due to polyphenols and flavonoids. These beneficial plant compounds have been linked to giving protection against chronic diseases like diabetes, cancer, and high blood pressure. In this article, I will examine scientific research into the medicinal uses of lemons. You will also find out how to get the benefits of this delicious citrus fruit and make your own lemon water at home. Lemon is a healthy, delicious fruit with a sharp tangy taste and it contains plenty of vitamins and nutrients. One lemon contains about 5 g of carbs mostly in the form of soluble fiber and simple sugars. Apart from having nutritional benefits, pure lemon juice also contains powerful antioxidants. Lemons are so versatile and can be used in many ways to enhance your health. Lemons have been used for medicinal properties since ancient times. They have been cultivated in China and India for about 2,500 years. Let’s look in more detail at how you can benefit from the healing and medicinal uses of lemons and lemon juice in your daily diet. Lemon is an amazing citrus fruit that strengthens your immune system and helps keep you healthy because it contains vitamin C.
A healthy immune system is essential to prevent infections like the cold and flu. Studies into the effects of vitamin C in boosting your immunity have revealed that it has a protective effect. You can find more helpful advice on how to stay healthy in my article on natural ways to boost your immune system. 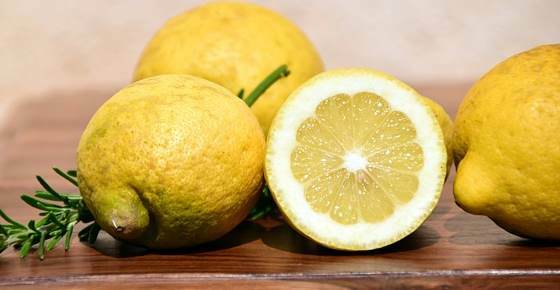 One of the benefits of consuming lemon zest is that it can help to protect against cardiovascular disease and heart disease. To get the heart benefits from the zest of lemon peel, some people grate lemon peel into their lemon water drinks. Please read my other article on how to greatly lower your risk of having a heart attack. Eating raw lemons or drinking lemon juice can help treat high blood pressure and reduce your risk of cardiovascular disease. Find out in this article, what else you can do to get your blood pressure down to be within the normal range. Drinking lemon juice with warm water is good for you because it can help to lower levels of LDL cholesterol (“bad” cholesterol) in your blood. Learn about more lifestyle changes that can lower cholesterol without the use of drugs. Because lemon has therapeutic elements that strengthen your heart and lower blood pressure, lemon juice may lower your risk of having a stroke. To help avoid suffering a stroke, please read my article on 10 life-saving tips to prevent stroke. Lemons are also good for treating kidney stones and preventing new ones from forming in your kidneys. Learn in this article how to use apple cider vinegar to treat kidney stones. If you suffer from iron deficiency or iron deficiency anemia, you should drink lemon juice regularly with meals to help increase iron absorption in your intestines. Many plant-based sources of iron like green leafy vegetables contain the type of iron called non-heme iron. This is poorly absorbed by the body and could lead to an iron deficiency if you don’t eat meat or seafood (which contains heme iron). In this article, find out about other ways to increase your iron levels. Lemon juice contains powerful compounds that can give your skin a better complexion and reduce the chances of having acne. Lemon juice is also a natural astringent and can help to reduce the appearance of large red pimples. If you have sensitive skin, you may need to use a natural acne skin cleanser that is gentler. Please see this article to learn about ways to get rid of acne naturally. Lemon juice can improve hyper-pigmentation and help to lighten age spots. Lemon juice is rich in vitamin C which boosts your skin’s health and the citric acid content helps to treat uneven skin tone. You can find more detailed information in my article on how to use lemons to treat sun spots and uneven skin. Adding the juice of one or 2 lemons to a spray bottle can be used as a natural disinfectant for surfaces around the house. Please read this article to find out about other foods that can help to control type 2 diabetes. Citrus fruits like lemons are rich in natural antimicrobial properties that can help to treat dandruff and stop your scalp from itching so much. You can create a hair mask using only 2 ingredients that are known to get rid of dandruff: lemon and yogurt. You can add honey to the mask or a few drops of carrier oil (such as almond oil) to prevent dryness of the hair. Just wash and rinse your hair, then rub the mask into the scalp, and leave for 10-15 minutes. You may apply this mask 2-3 times a week. Please see my article to learn how to get rid of dry itchy scalp using lemon juice and other natural ingredients. Some people say that lemon can burn fat. Whether that is true or not, drinking a glass of natural lemon juice every day can certainly help you lose weight faster. Lemon water can help to lose weight by increasing your fluid intake which can help to reduce appetite. Also, swapping healthy lemon juice drinks for sugary sodas will help to reduce your calorie intake. The soluble fiber content of lemons and lemon peel can help to get your digestion working properly. Powerful medicinal compounds in lemons and lemon peel have been shown to help reduce the risk of cancer. Also, research in lab test tubes has shown that lemon extracts can kill off cancer cells and stop tumors from spreading. Of course, more research has to be done to see how lemon and extracts of lemon can be used effectively in cancer treatment. Lemons for Teeth Whitening – What Does Science Say? You can even use lemon juice along with baking soda as a natural toothpaste to whiten teeth. Some people mix 1 tablespoon of baking soda and add the juice of half a lemon to clean their teeth. Does science back up claims that lemon juice and baking soda make a good tooth-whitening toothpaste? So, when used infrequently, occasionally adding lemon juice to baking soda to help whiten your teeth may not have any negative result on your oral health. Drinking a glass of lemon water every day may help to rid your body of toxins due to its antioxidant and anti-inflammatory effects. Wash 2 large lemons, cut in half, and squeeze the juice. Mix the lemon juice with 1 quart (1 liter) of water. You can also grate the skin of the lemon (lemon zest) and add it to the water (but it can be quite bitter). Drink a glass of warm lemon water 2 times a day to get the best health benefit. Please read this article to find out more about the benefits of drinking lemon water. If you are interested to learn more on how to cleanse and detoxify your body, you can find more useful information in my e-book The Detox Guide. 1. Choose fully ripened lemons that contain the most antioxidants (preferably organic lemons). They should have a full yellow color, as those that have green tinges have not fully ripened. Lemon not only aids digestion, but is also one of the best foods to cleanse your liver and encourage the production of bile, allowing your liver to flush out toxins much easier. What Are the Benefits of Frozen Lemons? The benefit of freezing lemons is that it makes using lemons every day easier. Because lemons can go bad, freezing lemons extends their life and prevents them from deteriorating quickly. In fact, frozen lemons can stay in the freezer for 3 to 4 months. You can either freeze whole lemons or cut them in slices before placing in the freezer for storage. When you want to use the frozen lemons, just grate the whole lemon on your food or into a glass of water to get the benefits from the lemon peel, pulp, and lemon juice. Check out my article on how & why you need to freeze lemons. Tooth erosion. Regularly drinking lemon juice should not have adverse effect on your teeth. However, to prevent any chance of weakening the enamel, you should not brush your teeth immediately after drinking lemon water. You could also drink through a straw to minimize contact with your teeth. You can also drink water after you consume lemon juice. Increasing urinary output. Lemons can act as a diuretic. Increasing your fluid intake by regularly drinking lemon water will make you pee more.